Developed by General Motors' (GM) in Detroit , the prototype FJ retained the basic FX shape, but that was about all. There's no arguing that the FJ Holden is one of Australia's national treasures. 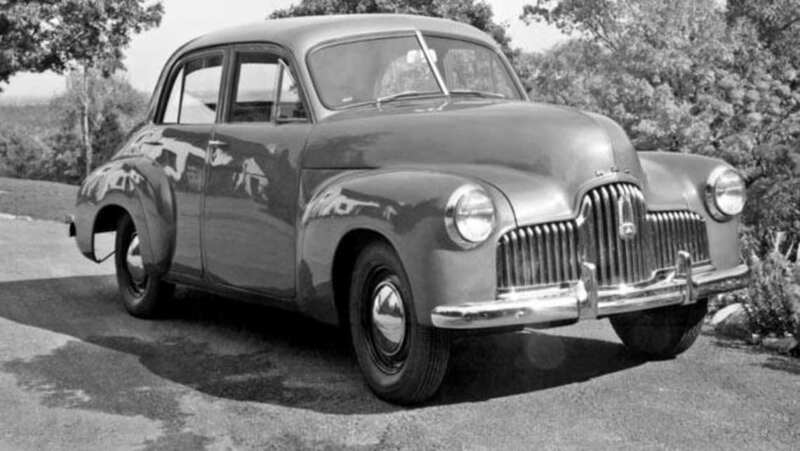 Released in October 1953 it was a very mild face lift of the original FX Holden (48-215 to give it its proper designation). Despite having only minor styling changes, the public did not really care. They just wanted a new car and the FJ was just different enough from the FX to keep sales buoyant. What is less commonly known is that General Motors Holden (GMH) was planning a more radically revamped car as early as January 1950, barely 18 months after the FX hit the showrooms, just in case sales of the FX started to slip. The Holden prototype pictured here is that car. Developed by General Motors' (GM) in Detroit , the prototype FJ retained the basic FX shape, but that was about all. 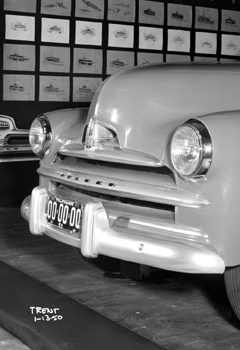 This image clearly shows that designers planned significant changes, making the car look wider, longer and lower in the true tradition of American styling trends. To achieve the desired shape stylists gave the car a substantial wrap around rear window and squared-off the shape of the boot. This gave the impression of increased width and lower height. The rear mudguards, previously rounded and falling away from the body to the rear bumper bar, were lengthened and straightened. The front guards were reshaped into a more linear style. Overall this gave the impression of a longer car without actually adding to length. At least 60 versions of the grille were drawn. Our research at GM Archives in Detroit has discovered at least eight different versions were mocked up from wood and covered in tin foil to simulate chrome. The image here shows just one version .On the wall in the background are more of the grilles drawn for consideration. And the car has fake Michigan state number plates. It is always interesting to speculate what would have happened if Holden had decided to go forward with a major reshaping of the FJ. The changes would have brought the FJ more into line with early 1950s Chevrolet styling themes. But would they have generated more sales? Our guess is "probably not". The accountants would have added up the numbers and concluded that less change meant less cost with no loss of sales in a car starved market. And all of that meant more profit. All images: Copyright 2012 GM Corp. Used with permission, GM Media Archive.